Buffalo State’s Patricia H. and Richard E. Garman Art Conservation Department will open its doors to the community during the annual Art Conservation Clinic, Friday, September 29, from 9:00 a.m. to 5:00 p.m. in the north wing of Rockwell Hall. This reservation-only event has been full for weeks and speaks to the much-desired service that the graduate art conservation program provides to the community. Individuals who have made appointments will bring in paintings, ceramics, historical documents, photographs, sculptures, and other artifacts to be evaluated by students and members of the art conservation faculty. Visitors bring family-owned art, as well as art from museums, archives, libraries, and other collecting institutions. Students and faculty will examine the pieces to see if they lend themselves to conservation treatment within the one or two years usually allocated for the projects. The department has offered the conservation clinic to private collectors and institutions in Western New York since the program moved to Buffalo State from Cooperstown, New York, in 1987. It has remained a popular service that benefits all parties. The public has another chance to visit the department during an Open House on Friday, October 27, from 3:00 to 5:00 p.m. and 6:00 to 8:00 p.m. 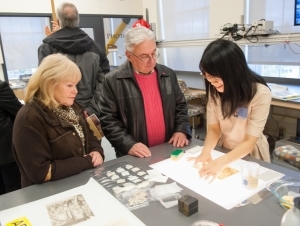 The open house gives visitors a peek into the world of art and cultural heritage conservation. All are welcome to come and see what the students and faculty have been conserving this past year and take a tour of the many studios and labs. Both sessions will feature the same presentations. No reservations are required. For more information, call (716) 878-5025.